#15 Who is the Antichrist? Who, or what, is the Antichrist? Evil alliance, or sinister individual? Some say his appearance is still in the future. Others say he appeared long ago in the days of ancient Rome. But the Bible indicates that he is alive today! 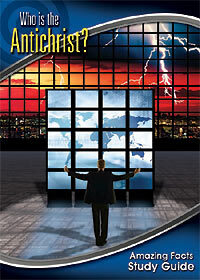 The Bible prophecies teach this antichrist power will play a crucial role in the final events of earth’s history. Do you know who he is? Are you sure? You need to be, for you can’t understand last-day events until you understand this evil power. Be prepared for one of the most intriguing Study Guides yet!